The Journey Through Hallowed Ground (JTHG) is a national heritage area running from the haunting battlefield of Gettysburg to Thomas Jefferson’s idyllic home, Monticello. It is richer in American history and lore than any other swath of land in the United States. The Journey Through Hallowed Ground Partnership, comprised of Destination Marketing Organizations, attractions, lodging and historic sites from four states, is the organization in charge of marketing this extraordinary region. It is dedicated to raising national awareness and increasing the number of people who travel to undergo this unparalleled American experience. Drawing from their collective brand research and instinct allowed the members of the JTHG Partnership to determine three basic themes for the destination: Land of Beauty, Land of Conflict and Reunification and Land of Leadership. They, nevertheless, had no clear understanding of the destination’s attributes that travelers find most compelling. They had no unified, articulate means of presenting, marketing and communicating The Journey Through Hallowed Ground. They also had little understanding of how to frame themselves within their competitive context. 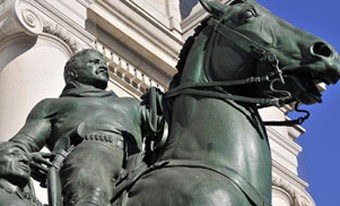 Washington D.C., the chief history and heritage travel brand, was their voluminous neighbor. The JTHG Partnership retained Destination Analysts to conduct brand research for The Journey Through Hallowed Ground travel product and develop an effective research-based messaging strategy to answer the primary question of how to best position the JTHG to the most lucrative audiences. Other key questions the Partnership sought Destination Analysts to address included: What levels of awareness and interest in the JTHG currently exist among domestic leisure travelers? From the traveler’s perspective, what are the essential elements (core values) of the JTHG brand that could drive visitation to the area? What competition exists in the marketplace, and how can the JTHG be effectively differentiated from this competition? What messages will most effectively persuade these travelers to visit the JTHG area? A series of in-person (and telephone) interviews were conducted with key JTHG stakeholders to gather a perspective on the JTHG from those intimately connected with the region and the JTHG development. An online national survey of 600 adult American travelers looked into the many facets of the JTHG brand and its appeal to various segments. Take the learning from the survey even further with one-hour in-depth interviews conducted with 20 traveling consumers, and 20 members of the travel trade and travel media. These studies yielded a competitive analysis, Strengths, Weaknesses, Opportunities, and Threats (SWOT) profile, detailed profile of the JTHG’s current brand attributes and the core values on which to base future branding efforts and messaging strategies and guidelines. Present the JTHG as a unique and profoundly moving personal experience. Suggest a hands-on connection with our shared national history. Bring together the three thematic concepts, but carefully repositions the Land of Beauty theme away from a generic beauty approach to one where the land and its beauty is tightly bound to the history of the place. Speak in an elevated and emotionally powerful language. In revealing the lack of clarity around the JTHG’s complex travel product, our research also had the practical benefit of showing that travelers were underserved by current JTHG informational assets. Destination Analysts identified several travel planning tools that would convert potential travelers, such as suggested itineraries by interest, and interactive maps. The research allowed the JTHG Partnership to best focus their marketing efforts, prioritize the travel segments to target, and pursue partnerships that would yield the most value. The Partnership is now confident in how to communicate The Journey Through Hallowed Ground experience, and the area continues to grow in awareness and viability as a travel destination.